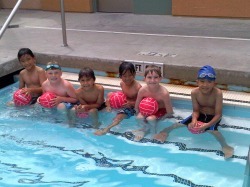 Learn to Play Water Polo for FREE this summer! Water Polo is a sport which develops individual skill, speed, conditioning and endurance as well as cooperative skills, an appreciation for teamwork and team camaraderie. But these are many of the by-products of just plain having fun! Come out and learn how to play the exciting game of water polo at Northwood Water Polo Club! This is open to anyone who wants to have fun and is able to swim. This will be an opportunity to try a great sport, learn the rules and the basics. If you have any questions about water polo or the program please contact us here. After the free session, you will have the opportunity to join the club for our Fall session. During the Fall 2010 Session (September-November) we focus on swimming skills for 45 minutes and then water polo for 45 minutes during practices and usually compete in one or two tournaments near the end of the session. Feel free to read more about our coaches and programs. Fall is a great time to get started as this will develop swimming skills and begin to develop an understanding of water polo.